There's just something special about tomatoes, especially garden-fresh tomatoes. Almost everyone, even non-gardeners, seem to have an affinity for a ripe homegrown tomato. When I teach, tomatoes and all their various uses (sauce, salsa, stewed, etc.) seem to be the impetus for enrolling in the canning basics class. 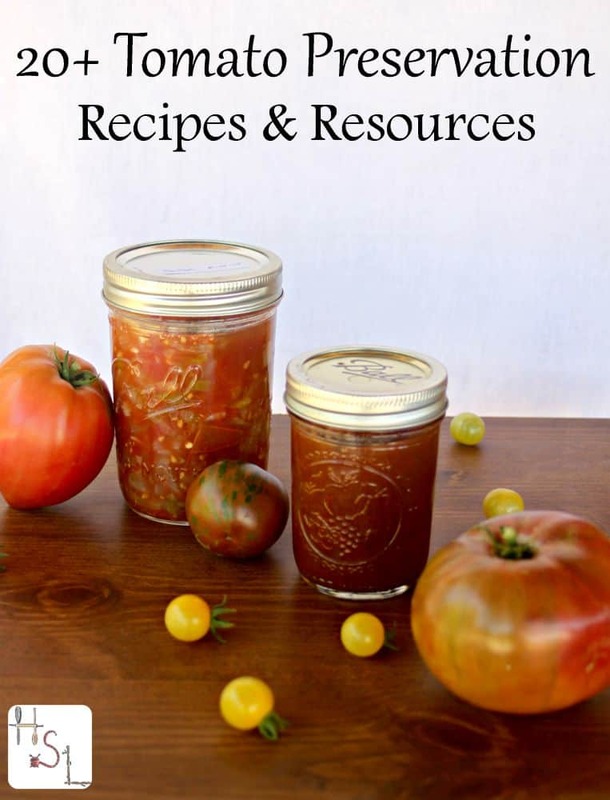 As tomatoes start to come ripe in earnest this summer use these tomato preservation recipes and resources to save them for the long winter ahead. When the days are long and hot and full of so many other things to do, freezing is a great and quick option. These recipes and tips will help you put up those tomatoes with little fuss and help you get out of the kitchen faster. Canning tomatoes usually takes longer than freezing but gives us numerous options and allows for a pantry full of condiments many of us use on a daily basis. Use these recipes and tips to fill the pantry shelves with everything needed to pull together gourmet meals in no-time. Have an abundance of green tomatoes? Try chow chow as a delicious condiment for burgers and more. Dried tomatoes come in many forms and have a multitude of uses in the whole foods kitchen. Fermented foods offer a number of nutritional benefits as well as different and tasty ways to preserve tomatoes for a longer season than they would keep fresh. Make the most of those ripe tomatoes this season and put some up for tasty meals until next year. Remember to mix it up and use some of each method if possible so that whatever recipe strikes the fancy later, home preserved tomatoes will easily be found in the pantry. Thanks for including our article. I can’t wait to check out the others! Would freezing tomatoes work for making salsa later?